Everyone’s says macarons are really hard to make. For starters, there are so many different ways to make a macaron- the Italian meringue way or the normal meringue way. Then there is the fine line between over mixing and under mixing the batter. The most difficult part is definitely sieving the ground almond and icing sugar. I kid. But it is the most painful part of making macarons. I decided to try the Pierre Herme recipe because I have friends who used it to great success and it’s Pierre Herme. I browsed through his macaron book while idling in Times one day and read through the tips he gave for making macarons. 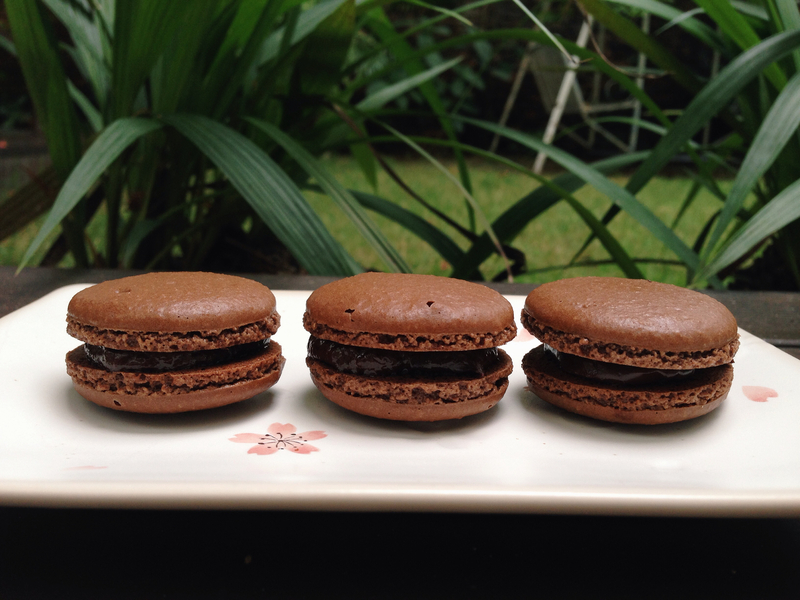 To make things easier for a first timer like myself, I chose to make chocolate macarons since the ingredients were the easiest to source. Pierre Herme’s recipe uses an Italian meringue which means making a syrup while beating the egg whites. It was difficult to multitask but with practice, I’m sure it will be manageable. The exact temperatures in the recipe also make me break out in sweat but we all know baking is about precision, especially these delicate macarons. I got worried when my egg whites were whisked to a foamy state (which was correct) and started to produce water when I added in the syrup but I kept the faith and continued whisking till it formed a beautiful perfect Italian meringue. Nothing can compare to the smooth, glistening appearance of an Italian meringue. Oh and important thing to take note is that you have to prepare the egg whites and let them rest for 1 week before using them. This is called ageing the egg whites. Another vital step to making a good macaron (defined by one with feet) is letting it rest after piping it into small circles so that a skin can form. I let mine stand for an hour but next time I’ll let it stand longer. The bakery I once worked at let the macarons rest overnight, proving how important the skin is for the feet to form. The only thing I found strange about this recipe is that melted chocolate is added to make the shell. I deduced that the melted chocolate gave my macaron shell a chewy texture with a soft outer covering instead of a crisp outer covering. Perhaps next time I would add cocoa instead? I shall search for another recipe for chocolate macarons but next up would be lemon macarons :))) I love lemons!!! 1. Line 2-3 baking sheets with baking parchment. Mark the parchment with circles 4cm wide. 2. Chop the 100% cocoa solids chocolate and put it in a bowl over a pan of just-simmering water, leaving it to melt and reach a temperature of 122F/50C. 3. Sift ground almond and icing sugar. Whisk to combine. 4. Add 110g of egg white to ground almond & icing sugar. Do not mix. 5. Put the mineral water in a small pan and add the granulated sugar. Heat gently until the sugar dissolves, then boil the syrup using a thermometer to track its temperature. 6. Put 110g of egg whites in a bowl and plug in the electric beaters. When the syrup reaches 240F/115C, begin to beat the second quantity of egg whites to soft peaks. 7. Once the syrup reaches 244F/118C, pour it slowly on to the whites, beating all the time. Keep beating until the mixture returns to a soft peak consistency and has cooled to 122F/50C. 8. Add the beaten egg whites to the bowl with the icing sugar and almonds. 9. Mix, then add the melted chocolate. Mix. 11. Tap the tray onto the kitchen counter a few times. 12. 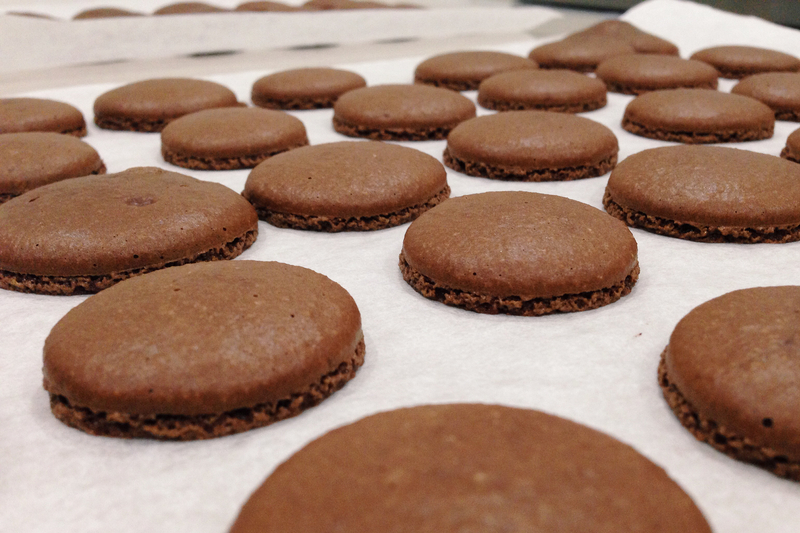 Let macaron shells rest for an hour until a skin forms. 13. Preheat the oven to 180 degrees Celsius. 14. Slide the baking sheets into the preheated oven. Bake for 12 minutes, quickly opening and shutting the oven door twice during the cooking time to let the steam escape. 15. Take the baking sheets out of the oven. Slide the sheets of parchment paper with shells onto a work surface and leave to cool. 1. Cut the butter into pieces. 2. Put the chocolate into a bowl. Boil the cream and pour about a third at a time onto the chopped 3. chocolate, mixing each time. The mixture will separate and look grainy, but keep mixing and it will come together. 4. Allow the chocolate mixture to cool to 122F/50C. 5. Add the chopped butter and beat until smooth. 6. Pour into a wide dish. Press clingfilm onto the surface of the ganache and refrigerate until thick enough to pipe. 1. Spoon the ganache into a pastry bag and pipe a generous mound onto a shell, then top with another shell, twisting lightly so that the filling spreads and bulges enticingly. 2. Store covered in the fridge for at least 24 hours to allow the inside of the macaron shells to soften. 3. Bring back to room temperature before eating.